Video blogging is one of the fastest ways of becoming famous. This is because compared to traditional blogs, which tend to be made of texts that would typically make the site visitor tired or easily distracted at some point while reading the content, video blogs are easier to digest since you can see and hear everything. This is a common issue that most bloggers tend to have when it comes to keeping site visitors interested in your blog. Most bloggers counteract this issue by keeping the topics as short and simple as possible, but this act typically reduces the quality of the overall topic and thus reduces the reliability of the information being shared on the blog. Another common method of keeping the site visitors interested would be to either provide a video or audio version of your blog site so as to catch their full attention. Which leads to the concept of creating video blogs as an effective means of actually keeping site visitors and site viewers coming back for more and more new contents and videos. As the times go by, there will be a need to create a video log so as to archive some information and facts about a certain thing, thus the resurgence of the original purpose of creating a blog, which is to ensure that information will always be passed on to the next generation, which remains to be the single most defining factor or purpose as to human existence. 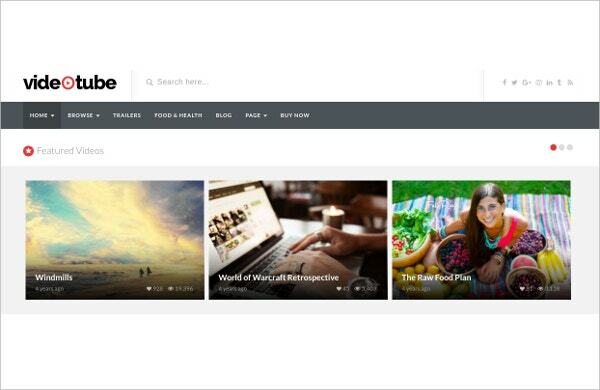 PlainTube is a beautifully designed video blogging or sharing site theme template that instantly captures the idea for displaying videos by directly providing the different available video blogs. This theme would allow visitors to easily select the type of blog they wish to view as well as providing updates to the viewers in the form of suggested videos. Aside from the design of the homepage as an effective means of promoting viewer’s interest, it also allows viewers to easily navigate the site simply by adding several directories into the Web page. However, for the site manager, this theme is not limited to this design. It can be redesigned in various ways to suit your desired design. This is because of the HTML5 and CSS3 coding used in the creation of this website. The coding, although appearing simple and easy to understand, was originally a complex set of codes that would typically take a person several hours just to identify the problem, but with the coding done by the developers of this theme, the code appears clean and easy. Another way the site could be redesigned would be the implementation or addition of widgets such as links to social media sites (Facebook, Twitter, Instagram, etc.) and widgets that would allow for the addition of advertisements to the website. What’s the first thing every person does when they visit a site that is related to video streaming or sharing? Identify what videos are available as well as the quality of each video. 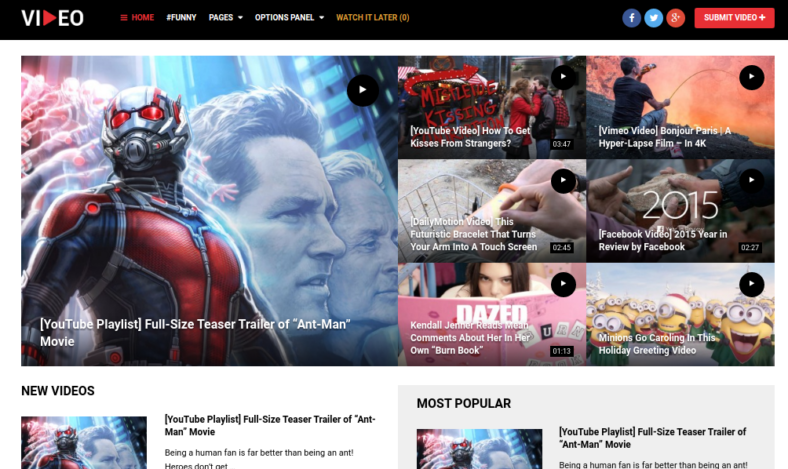 With this in mind, the creators of this video blog theme was able to create this theme simply called VIDEO wherein the idea for this theme was to create a site that would allow the viewers to easily navigate and view any and all of the latest videos while still being able to browse the old videos as well. VIDEO is a WordPress theme that is specially designed to be used as a means of supporting the creation of websites that would be adding videos and other media files to the site for online viewing, and like all video streaming sites, there will be some means of identifying a popular video from an adequate video. This method is typically in the form of like or dislike where the viewer will vote if the video is good or bad to watch. This video blog theme template is also capable of tracking how many people are viewing the different videos at any given time so as to help determine the most demanded and watched videos, which would then be added to the homepage of the site. 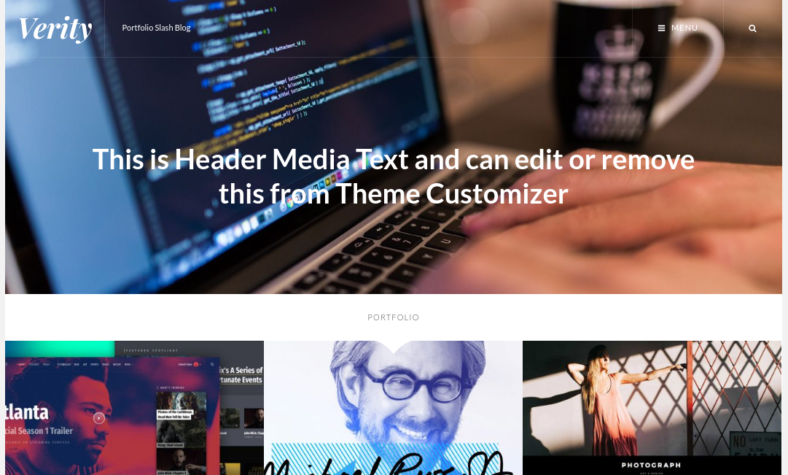 Crista is considered to be the most powerful professional WordPress theme when it comes to uploading videos and media files for streaming and viewing online. This theme can also support more advanced features when it comes to more sophisticated designs and layouts for the creation of a more dynamic and more attractive perspective. 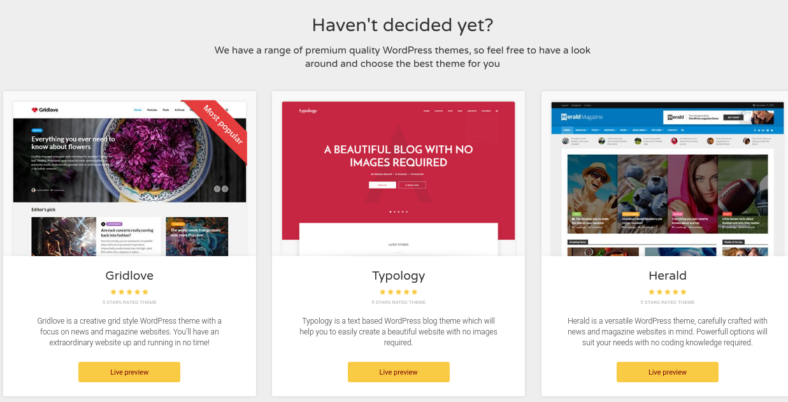 Being the most powerful best WordPress theme also means it is capable of performing more task but reducing the actual workload of accomplishing each task. For example, thanks to the drag-and-drop feature of this WordPress theme, it can allow for much easier uploading of images, videos, and even files into the website. It is also equipped with a feature that is called responsive theme, wherein the website can be accessed from any device; whether it be a laptop, a personal computer, a tablet, or even a smartphone, they are all accessible. Upon purchasing this theme, you are also entitled to free lifetime updates as well as quality technical support when it comes to managing or maintaining your site. Videodune is a type of website blog that is focused on a magazine-like feel with the addition of video blogs and video files. This is done so as to achieve a clean and simple design that actually creates a sense of perfection to its design. 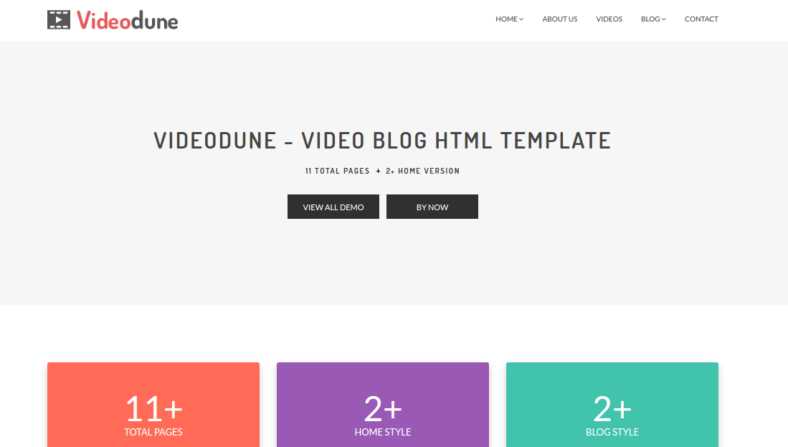 Videodune is a rather basic theme wherein it is rather flexible in terms of customizing the website blog to your preferred style and taste. 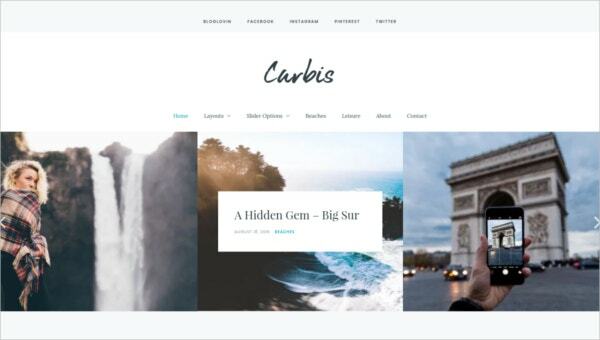 This is mainly because of the fact that the features that come with this theme template are a rather efficient means of creating complex yet simple-looking website blogs. This type of website theme is made with the idea that this theme will be used for the creation of sites that are dedicated to the streaming, uploading and sharing of video files. The most suited topic for this type of video blog HTML template would be for the creation of video blog sites, news sites, and even video streaming sites. 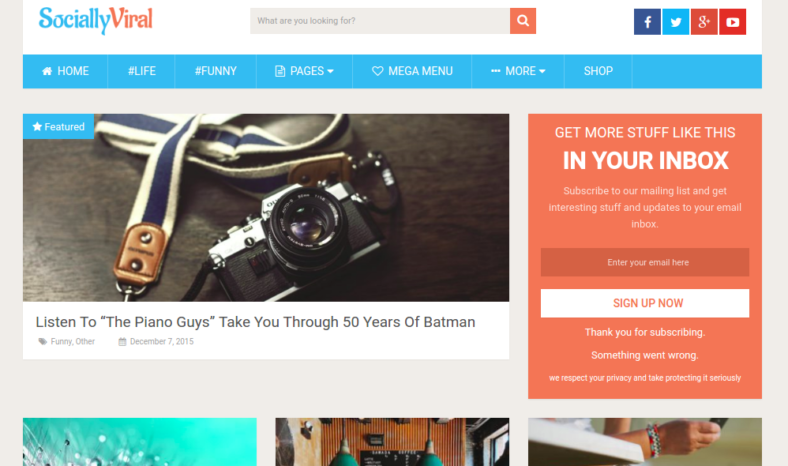 An advantage of using this theme template would be that this theme template will allow you to have two home pages. What is the advantage of having two home pages? Well, the obvious answer is that it will allow the site manager to appear to have two different sites, thus, in theory, double the number of viewers and visitors to the sites. The theme is created with the idea that the theme should appear creative yet modern at the same time so as to display the credibility of the site in terms of trends awareness and updates. The flexible power builder feature is often considered to be a revolutionary means of designing and creating a website. This is because it reduces the process of creating a site from what would typically take the site managers hours’, if not days, worth of coding, and reviewing can simply be achieved in a few hours through the usage of the drag-and-drop function of the power builder. Another use for the power builder feature would be to easily create and design the layout of your website with little to no hassle. Aside from the innovative method of Web designing, you will also be given fifteen topical images that you could use as the background of your site or for the theme of your site. Verity Pro can be considered as an attempt to create a more modern designed website that is completely functional as well as easy to use and maintain. This basic yet stylish theme is made in an elegant way. This is done with the intention of creating a perfect theme for the sharing of media files, be it images and/or videos. The beauty of the design is achieved mainly by how each item on the Web page is positioned as well as the purpose of each item being positioned in such a way. Aside from the layout of the Web page, its appearance also benefits from the unlimited color combinations a Web manager could use to design and create a more colorful user interface. But this site is not solely dependent on just its looks, it also has a modern way of functions and features. Functions such as a customizable user interface with optional widgets and add-ons, social media access and sharing shortcuts, and many more features. As of any and all available website theme templates today, there will be the implementation of a responsive design so as to have the site available on any device, thus increasing the range of visitors to the site. There was actual research done that suggests most people nowadays rather use their smartphones and tablets whenever they are searching for anything, be it an interesting topic to read, viral videos, medical question, etc., as to searching it through their personal computers mostly because of two factors: easier access and less preparation time to view the site. Social media remains to be one of the most effective means of promoting a website. This is mainly because of the fact that social media websites are websites that are dedicated to the interaction between social media accounts. With this in mind, the design for SociallyViral is focused on creating a website blog that resembles that of a social media website so as to give the website visitors and viewers a sense of familiarization. SociallyViral is a beautifully designed WordPress theme that is made as a means of creating an engaging user interface, to use very little system resource, and even boost viral traffic by means of easily sharing and promoting the website through easy access to social media sites. There are also built-in features to this theme that would assist you in boosting your search engine ranking. This theme is also rather responsive, meaning, it will allow different types of devices access to the site. Note, this was one of the problems of some sites back in the past but is not fixed simply by changing a few codes. This theme also consists of several other features such as rating systems, which will allow you to determine the popularity of a video. It also consists of a feature that would allow for the translation of language either by means of adding subtitles or adding translated texts. This theme is also made with what is considered as a clean code feature wherein if you do wish to change the code being used for the site, then you can actually do so easily since each code will be made in a way that will basically guide you on what the purpose is for each of the code being shown. Vlog or video blog is a website theme that specially caters to the creation of video blogs or essentially any video streaming website that will require the uploading and maintaining of video files on the site for everyone else to see. Judging by the appearance of the website’s theme, one can easily determine the dedication to videography this website theme aims to achieve. Video blogging is one of the more newer trends when it comes to blogs. This is because video blogging is basically blogging that is done by a blogger via video recording. This can be done live or can be posted after the actual action has been accomplished. By the design of the theme itself, you can determine that this theme has more than one available layout for your video blogs, each one catering to a more specific topic for a video blog. This theme comes with several features that would allow the site manager to manage and run the site easily while smoothly uploading more videos and media files so as to increase your viewer rating. This can be done by implementing the ever popular drag-and-drop systems as opposed to the previous method of adding specific codes and links and file locations. A rather handy feature that Vlog has is that this website theme supports the implementation of video importing, specifically YouTube video importing wherein YouTube videos are easily imported to your sites, with the necessary precautions and requirements. Aside from importing the videos, you are also capable of using the videos imported as the actual thumbnail for your videos, removing the need to upload additional images for the thumbnails, which can make your site much lighter in terms of network connections. Another rather useful feature would be the ability to create video playlists that can help segregate every video to specific categories that would allow for easier video browsing or searching. Video games make for a great video blog topic simply because everyone, in one way or another, is interested in playing video games, be it simple first-person shooter games or complex multiplayer online battle arena games everyone has a preference; therefore, everyone will be interested. After all, games are considered as necessary distractions and experiences that a person can feel upon interacting with the game, which eases the stress and tension of living in the real world. The name of this theme is Streamline, and this theme captures the idea streaming online videos regarding video games perfectly by displaying video blogs about the person’s experience with specific games and categorizing each of the genres of the video games for easier site maintenance and directions. Although this theme does seem complex, it is actually a simple process to make mostly because of the usage of clean codes, which are done in the background. However, there is the option of not needing any codes whatsoever in the creation of the site. This is possible through the usage of a built-in user-friendly interface that implements the drag-and-drop functionality as well as the layout creation functions. Aside from every other feature stated about this site, there is also the feature that would allow the person to easily get help in managing their site because of the 24-7 technical support that is available to you upon purchase of this Web blog theme template. Aside from the 24-7 technical assistance that will be provided to you, the site manager, upon purchase of the theme template, you will also be granted access to the built-in guide. What is a built-in guide? A built-in guide is essentially a guide that is used to help fresh site managers maintain and operate the website efficiently and effectively. Creating a blog website with the word news in it is a great way to gain traffic fast because people who will be visiting the site will be expecting news or rather bits of important information that the average person must know in order to be a more efficient member of society. In short, simply adding the word news in the name of any site will set standards and expectations that your site must adhere to reach. 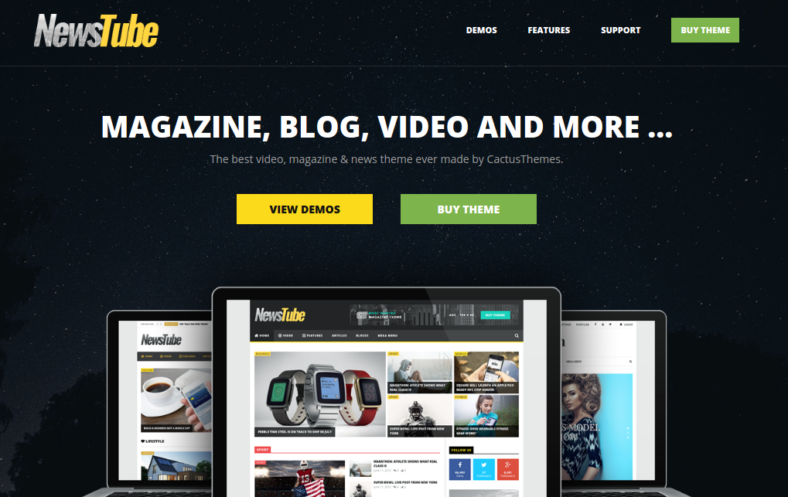 NewsTube is a simple, clean, and well-structured theme for any website that will be dedicated to magazine sharing, any types of blogs as well as video streaming sites. This is mostly achieved through the introduction of a feature wherein the site being made can be accessed through any device. Another feature that contributes to the diversity of function of the theme would be well-structured retina-ready feature, wherein the retina-ready feature is used as a means of preventing overexposure to lighting and other harmful effects that would occur from staring at the site for too long. NewsTube can also support and import videos that originate from other sites such as YouTube, Vimeo, and Dailymotion. This is done so as to easily share and promote their other sites in response to the launching of this site. As an added bonus upon purchase of this WordPress theme template, it will give you access to free online support as well as access to a variety of different layout designs, color schemes, and even background choices. Yogi Pro actually focuses on the aspects of creating a blog, whether it’s a basic Web blog or a video blog, it is determined by the site manager. 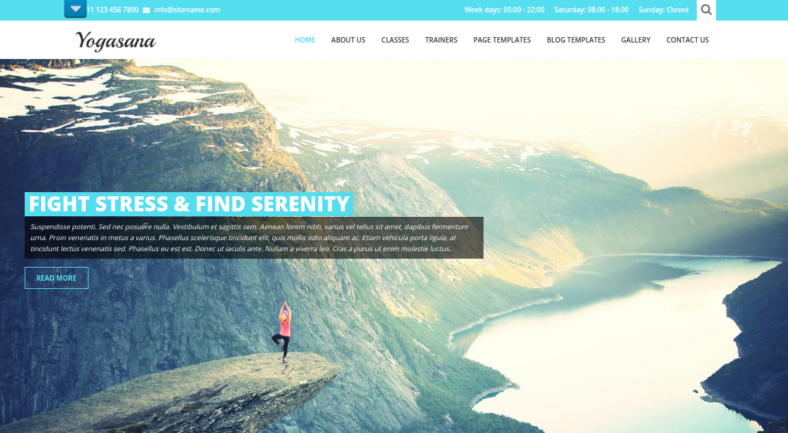 Either way, this personal website theme template is made so as to create a blog dedicated to yoga. Yoga is the act of setting the human body in specific positions so as to clear the mind of the person and relax the body. As of late, yoga has increasingly become a hobby that has an ever-increasing amount of followers most seeking enlightenment, others seeking a means of increasing their endurance. Regardless of the reason as to why a person wishes to conduct such a task, it is indeed an effective stress relief method. Thus its increase of popularity makes yoga a fine topic for a Web blog or a video Web blog. A responsive design that allows for easy access to any type of device. Unlimited color changing schemes that could color and highlight the website as the website manager sees fit. It provides 580 icon packs that can be used to further decorate the Web page to the website manager’s preference. Easy social media integration to the site for a better increase of Web traffic. A gallery feature that would allow the person to easily manage and maintain every upload of videos and images. Easy and clean responsive HTML5 and CSS3 codes for easy alterations.